A grieving mother hires a medium to contact her dead son. More so than any other genre, horror attracts first-time filmmakers like vultures to a rotting corpse. It makes practical economic sense, as it's far easier to produce and sell a comedy featuring lap-dancers battling zombies than a serious period costume drama. As a result, we see a lot of horror movies from directors making their feature debuts, and all too often it's clear their hearts aren't really in it, that they're working in a genre they neither respect nor understand. That's not an accusation you can level at Liam Gavin, the writer-director of occult chiller A Dark Song. Every frame of his first feature tells you he's pouring out his heart to explore both a cinematic obsession and a philosophical compulsion. It's clear Gavin is a cinephile, as his film contains subtle nods to genre movies of the past that never feel like the filmmaker is winking at fans, but he's also interested in using the horror genre to ask some existential and spiritual questions. The initial setup of A Dark Song may not strike you as the most original - grieving mother Sophia (Catherine Walker) hires a medium, Joseph (British genre mainstay Steve Oram) to help her make contact with her dead son - but Gavin explores this dynamic with a depth we've rarely seen before. Sophia and Joseph are two of the most compelling characters we've seen in horror in recent years, and the tension between the two is multi-layered, the former a quiet, middle-class Catholic, the latter a gruff, working class occultist. At Joseph's insistence, the two hole up in a large, isolated house in the Welsh countryside for an initially undetermined amount of time that Joseph claims could last for months, after he surrounds the building with a circle of salt, a move familiar to fans of Hammer's great Dennis Wheatley adaptation The Devil Rides Out. As the weeks go by and Joseph fails to produce any tangible results - all the while subjecting Sophia to all manner of physical and psychological traumas, some of which would be considered sexual abuse in any normal scenario - we begin to question his qualifications and motivation, and the notion that Sophia may have become the unwitting voluntary victim of an abductor takes root. Thus the movie works as both a psychological thriller and supernatural chiller, while keeping us guessing as to which it really is (or perhaps it's both?). 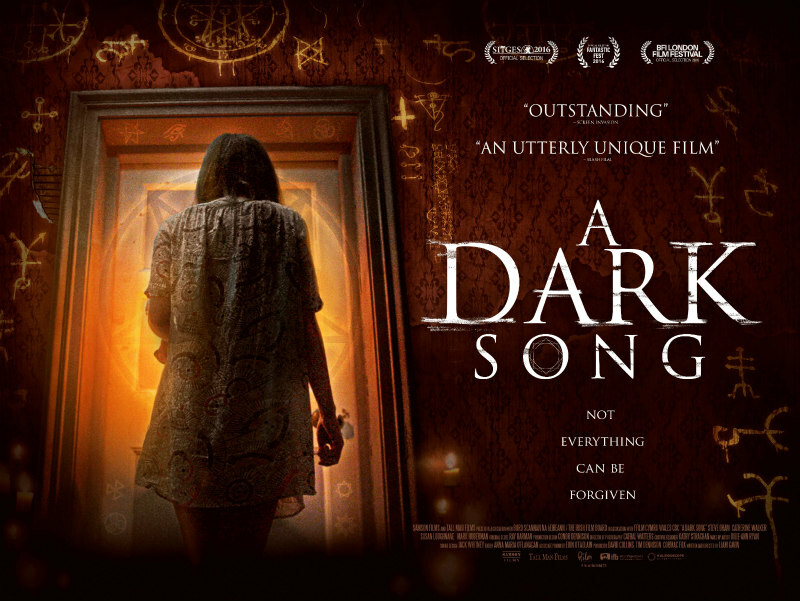 Horror fans often groan when a genre film is given a PG rating, but were it not for some sexual content, A Dark Song could easily achieve such a certificate. The great horror filmmakers don't require violence or gore to exploit the genre, and Gavin trades fake blood for real brains as he gives us food for thought with the film's intense exploration of occultism. I can't think of another movie that delves so deep into the minutiae of the science of contacting 'the other side'. In comparison with the superficial practices of the spiritual protagonists of the Conjuring and Insidious franchises, A Dark Song plays like a Tarkovsky film, so concerned is it with the great question of what lies beyond the physical plane, and its climax is Kubrick's 2001 by way of Lucio Fulci. 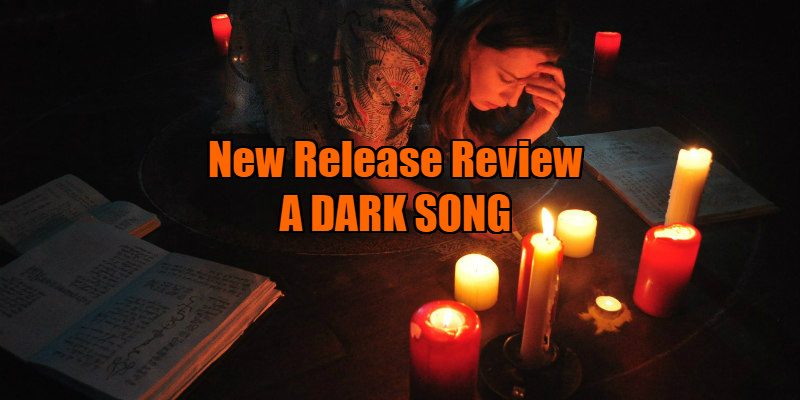 An intellectual horror film A Dark Song may be, but Gavin doesn't skimp on the scares. Commendably there are no cheap cop-out fake jump scares here; this is a film more interested in keeping us in suspense and subtly racking up the tension than in hitting us with intermittent shocks that allow us to settle back to a state of comfort immediately after the split-second surprise of the cattle-prod wears off. Its widescreen frame is used to great effect, particularly in a nerve-wracking extended shot that uses negative space on one side of the frame to genuinely terrifying effect. Gavin understands the disturbing potential of emptiness, both as a compositional tool and as a metaphysical concept. Nothing scares us quite like our thoughts, and A Dark Song weaves its way into its viewers' minds, working its subtle black magic against us. A Dark Song is in UK/ROI cinemas April 7th.